Newly renovated large studio with private second floor entrance and patio. Separate sleeping, sitting, kitchenette/dining areas. Fully furnished w/new furniture, linens, towels, kitchenware & supplies. 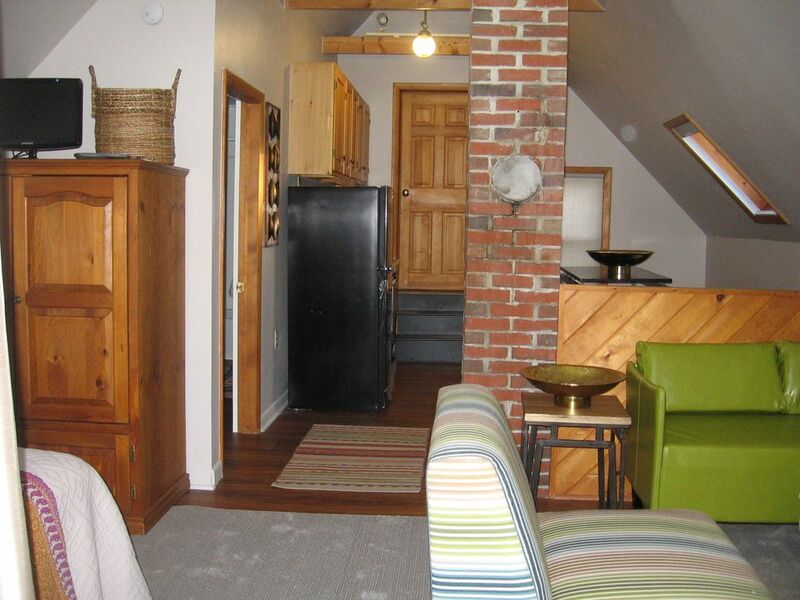 Kitchenette has full size refrigerator, microwave, electric fry pan and large toaster over. Full bathroom with tub/shower & washer/dryer. 1 block to downtown Thomaston and 4 blocks to Thomaston harbor and public landing. 10 minutes to Historic Rockland which is home to the Blues Festival, Lobster Festival, museums, shops and our magnificent Rockland Harbor. Apartment includes cable, WIFI, washer/dryer, private entrance, patio & parking. After many years in Denver Colorado, it was time to come home to my Maine roots. In 2000 my husband, son and I came back to Maine. We live here year-round suffering through the harsh winters to enjoy our glorious spring, summer and fall. Full bath with step-in shower, washer/dryer, towels, soaps, hairdryer and necessities. Fully equipped kitchenette with dishes, glassware, silverware, serving dishes & microwave containers, soaps and towels. Kitchenette does not have a stove. The owner Jeannine was amazing. She left us treats. Had everthing we needed, comfortable, quiet. Extremely pleased with how clean, neat and organized the place was. Felt right at home. The studio is more charming than the pictures show. It is immaculate and in a quiet-quaint neighborhood. Jeannine has thought of everything. She is available and attentive but never intrusive. This is a great location for coastal drives and exploring mid coast Maine. I recommend it without reservation. Great little private and newly renovated apartment with easy access. Located in Thomaston, you're a short drive from Rockland and Camden, and about 2 hours from Bar Harbor to the north. Host was charming and accommodating - looking forward to returning!! We had a great stay. The apartment was impeccable and the decor was so cool! Every little detail was thought out making the apartment feel like home away from home. The owners were very nice and helpful with restaurant recommendations and local points of interest. The town of Thomaston is really quaint and welcoming. We would highly recommend staying here! Thank you again to our hosts! The Lees were lovely, friendly, caring hosts. Jeannine was waiting for us when we arrived and gave us the grand tour of the charming farmhouse apartment. The location was perfect for our treks to Rockland, Camden, Lincolnville and Port Clyde. Thomaston, itself is adorable and has lots of history. The rental had everything we needed and then some (sleep masks in case the morning sun shone too bright through the skylights :-) ). A fresh bag of coffee, creamer, bagels and muffins were a lovely welcome. The decor was simple yet tasteful; very much my own style which made me feel right at home. This apartment is really only suitable for one or two people...my husband said it would be a perfect bachelor pad! Great restaurants in Rockland too...just a 10 minute drive. I would highly recommend staying here while exploring gorgeous Maine. Sincere thanks to our hosts for sharing their beautiful home! Jeanine made my experience so welcoming ,greeting me at bus, taking me by the grocery store, including a tour of area. Lots of thoughtfulness and little touches that made staying there so comfortable! The accommodations were perfect for my needs. I was only one block to town library where my art class was based. I enjoyed walks around the town, loving the beautiful scenery and architecture. I was minutes by car from Rockland and St George peninsula , which offered more beautiful views , walks and interesting sites.